Clean toilets are seen as a luxury in our country. Case in point: paid vs free restrooms in the mall. Pay 10 bucks, you get toilet paper, soap, dryer, paper towels and a clean bowl. Pay nothing and you end up with a dirty hole to do your business in, no tissue and you're lucky if there's even running water around. This really irks me because clean toilets aren't a luxury, they're a right especially for taxpaying citizens and consumers which basically consists of the majority of our population. We deserve to have clean toilets everywhere we go with soap, tissue and toilet paper!!! No more piss on the ground muddy floors and toilet seats laden with grime and shoe prints from people who are afraid to catch a disease. Diarrhea is the leading cause of child illness and fourth leading cause of death in children under five years old. And it isn't just diarrhea that we should look out for, there's also influenza, hepatitis and more. We should also consider the fact that when kids are healthy, they don't miss school and have a greater chance of finishing and finding a good job after. Get the snowball effect of clean toilets and proper sanitation? However, clean toilets and bathrooms don't just mean randomly scrubbing with detergent/bleach and water. You need a specialized cleaner that is equipped to handle bacteria and germs that contaminate restrooms - A cleansing agent like Domex plus the proper steps and techniques to ensure bacteria from spreading cross-contaminating different surfaces. And that is what Unilever and Domex's One Million Clean Toilets Movement is all about. It's a team up of Unilever with Unicef, Philippine Public Health Association, the City of Manila and Pilipinas Shell to raise awareness about the importance of maintaining proper toilet sanitation through a series of year-long cleaning and education initiatives. The aim of Domex's One Million Clean Toilets Movement is to collect a total of one million pledges from private households to conscientiously maintain their own clean, safe and hygienic bathrooms by the next World Toilet Day in 2014. Domex will donate P5 to UNICEF's Sanitation Program for every pledge received. It's a win-win people! Clean toilets all around plus a brighter future for everyone and all it takes is less than a minute of your time and a digital signature. Join us and make the pledge for ONE MILLION CLEAN TOILETS! For quick sign up and clean toilets for everyone, click HERE. 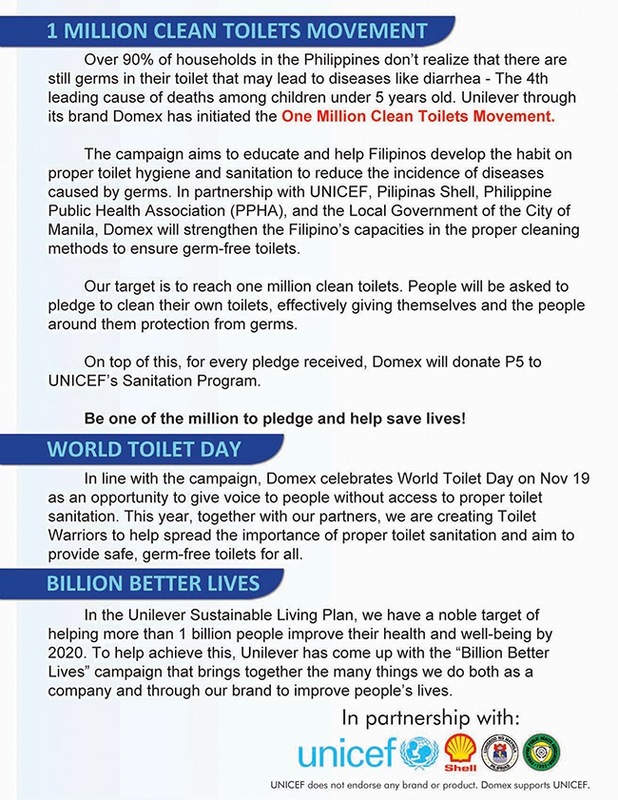 Domex One Million Clean Toilets Movement is part of Unilever's "Billion Better Lives" Sustainable Living Plan (USLP) which aims to help 1 billion people improve their health and well-being by 2020.